Live at the Georgia Theatre: Bobby & Sarah's Wedding Proposal! I arrived at about 930am on this particular sunday morning in order to find the best angles and just get familiar with the downtown surroundings. The scheduled time was 10:15 a.m. so this left me about 45 min to scope out downtown athens during some of it's calmest hours. I have to say there isn't any place quite like downtown Athens, GA. All the cool old store fronts and huge old trees lining the streets. During that time I also watched the shadows perfectly dissappear from the marquee right as the arrival time neared for Bobby and Sarah. As the couple rounded the corner the whole intersection was instantly filled with their joyous surprise and excitment. Even a few students that happened to be walking by gave their congratulatories. 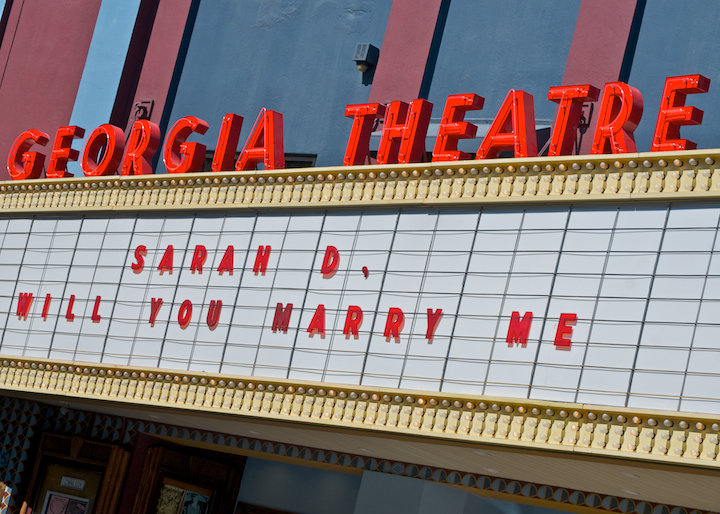 Needless to say Sarah said "yes" as they enjoyed each other, the moment and each marveled a little in Bobby's genius Georgia Theatre marquee proposal! Here are a few photos from that summer sunday moring in Athens.